This week a rumor circulated that Activision had sold the rights to Crash Bandicoot to Sony, perhaps laying the groundwork for a PS4 revival of the series. However, Activision says that they didn't sell off the long-missing mascot. “Activision owns Crash Bandicoot and we continue to explore ways in which we could bring the beloved series back to life,” a spokesperson for Activision told Game Informer. "I love Crash Bandicoot. Those were some of my favorite games growing up and I would love to find a way to bring him back, if we could." This Reddit post summarizes all the recent quotes and other clues. Activision and Sony never outright confirmed that Crash was coming back but there's certainly interest there. These companies' desire to bring back Crash hasn't amounted to much, though. There hasn't been a new chapter in the main series since 2008. Crash Landed, a reboot by Prototype studio Radical Entertainment, was cancelled back in 2010. Crash Team Racing 2010 was scuttled around the same time. Activision and Sony couldn't even find a way to put Crash in the cross-over brawler PlayStation All-Stars Battle Royale despite rumors. As of this weekend, Activision says that they're exploring ways to bring back Crash. What are they waiting for, exactly? Five years is a long absence for any series. It's unlikely that Crash Bandicoot will get more popular as the years go by. If they wait too long, most fans with any interest in a reboot will have moved on. If Sony wants a new Crash game, maybe they should buy the license from Activision. To Activision, Crash is just one of many licenses collecting dust in their vault. Would they really put resources into a new Crash game instead of Skylanders, their billion-dollar kid-friendly platformer franchise? 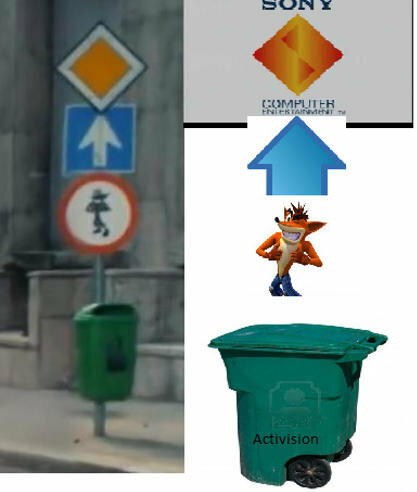 Crash is much more valuable to Sony than Activision. He's a one-time PlayStation mascot and a link to the "good old days" of the first two consoles. I think Sony would be less likely to sit on the license than Activision is - especially if they've paid to get him back.